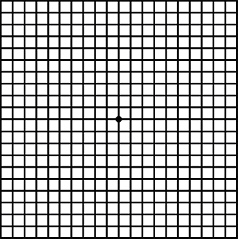 The macular degeneration grid, better known as the Amsler grid, is an eye test that helps to detect changes in your vision. It is a test that one can do from home. This macular degeneration test is for you to use at home to monitor any vision changes. By looking at the Amsler grid, with one eye, you can check to see if there is any changes in the way you see the grid. By noticing any changes in how the grid appears, you may be able to detect any new blood vessel growth in the macula lutea. Early detection of leaking blood vessels will allow your physician to provide earlier treatment. For treatment to be effective, earlier detection of wet macular degeneration is critical. Patients who have the dry form of macular degeneration should regularly check their vision, as it can develop into the wet form and those with wet AMD need to monitor for new leaky blood vessels. If you do notice any changes in your vision, contact your eye care specialist right away. 4. Hold the test at arm's length. Test your eyes consistently at the same distance - around 12"-14"
6. With the uncovered eye, stare at the black dot in the center of the grid. 7. You should be able to see the center black dot and the four corners and sides of the grid. The lines should appear to be straight and continuous from top to bottom and side to side. 8. Now test your other eye. If you notice any wavy lines, distortions, or dark or blank spots contact your ophthalmologist immediately. Some specialists recommend that you use a different printable chart for each eye. Mark on the chart where you notice blurring, blank or dark spots, or distortion so you can share the information with your eye doctor. Your physician may use this macular degeneration test during your eye exam. There is no one test, but rather several exams a physician will use to diagnose macular degeneration. Home monitoring using the grid or chart does NOT replace regular eye exams with your eye doctor. Become familiar with them so that when you do have your next eye exam you will be prepared with questions to ask your physician to see if you have any early signs of age related macular degeneration. 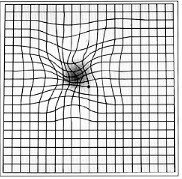 You can normally obtain a free Amsler Grid from your eye doctor's office. 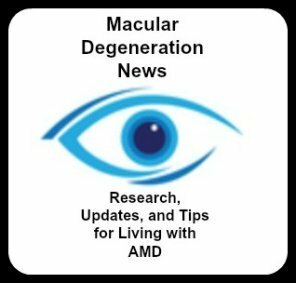 If they have not provided you with one you can download and print the document from the American Macular Degeneration Foundation. You can request a free magnetic version of the Grid by calling Bright Focus Foundation at 1-855-345-6637. The information provided in this section of www.WebRN-MacularDegeneration.com is a public service, and should not in any way substitute for the advice of a qualified healthcare professional, and is not intended to constitute medical advice.